As a young woman must marry and become engaged in proper duties, art can only be an accomplishment and a recreation. Despite opposition at every turn, Charity Baxendale dreams of becoming a renowned portrait painter. She is heartened to receive two significant commissions from esteemed family members, and when a rakish Scottish baron commissions her to do his portrait, she dares hope she is one step closer. When Robin, Lord Stanberry, with whom Charity has had a long friendship, asks her to marry him, she must choose between marriage and her career. Robin is heir to a dukedom, and Charity fears that not only would she be unsuited to life as a duchess, but also that her burgeoning career might end before it begins. And besides, Robin has made no mention of love. After his uncle and heir die, Robin becomes the Duke of Harwood. Never having expected such an event, he feels himself unfitted for such a position. He was perfectly content living as a viscount in Tunbridge Wells, writing a manuscript on ornithology. Now he must leave all that he loves. He’d hoped to have Charity at his side by the time he took his place at Harwood Castle, for her pragmatic nature and strength of character would be of enormous help to him. Should he have thrown himself at her feet and declared an undying love? Charity would have seen through it, for that was not the sort of friendship they enjoyed. But her refusal has brought him lower than he’d thought possible. Can he change her mind, despite the distance that now lay between them? 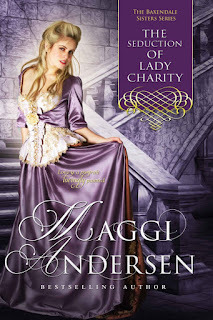 Lady Charity is the latest in Maggi Anderson’s series of the loves of the Baxendale sisters and like all the others, this one is equally engaging. Each sister is different, and they are all charming in their own ways. The men they are attracted to are a diverse lot, not one a cookie cutter Regency Darcy type. Some are mild, loving and adorable while others flirt with danger as well as their women but are all honourable and sincere, even if their families have skeletons. Irresistible in fact. Robin, the young man who is in love with Lady Charity is the former type, gentle, unassuming despite the fact he inherits an unwanted dukedom [Oh the trials of life] All he really wants is Charity and he’s willing to bide his time until she comes round to his way of thinking and stops thinking of him as just her childhood friend. Ms Anderson’s female characters are always true to the rules of Regency life, and there are no real rebels who flaunt society, but young ladies who might appear complaint but all have a core of steel and won’t compromise. Perfect for a cosy night by the fire or a beach holiday, with engaging characters you cannot fail to love. The delightful Lord Baxendale is worth mentioning as a man who knows his girls and misses nothing. Lovely. If this is your first dip into the series, the rest are all worth your time and effort.